Learn how to brake safely and avoid brakes skidding. This guide explains how stopping distances and speed can affect the way you control your vehicle. HIGHWAY CODE CONTROL OF THE VEHICLE: The section covers the correct procedures for braking. It also describes how to brake in an emergency situation and what you should do with a vehicle skid. The UK Highway Code provides extra information on the typical distance it takes to stop your car. It reminds motorists to combine the thinking distance with actual braking distances. That is why all drivers and riders need to have full attention on controlling their vehicle at all times. Note: Driving in adverse weather conditions, the road surface, and vehicle condition affect braking distances. Rule 117: The safest way of braking your vehicle in normal driving circumstances is to apply the brake early and light. As your car begins to slow down and stop, you can then apply a little more pressure to the brake pedal. Easing the pressure off the braking system immediately before the vehicle comes to rest will help to avoid a jerky and abrupt stop. Rule 118: Braking in an emergency should be immediate! But, you should attempt to avoid hitting the brake so harshly that it locks up the wheels. This type of emergency braking can lead to a loss of control of the vehicle. Rule 119: Vehicle skids are most often caused if a driver brakes, accelerates, or steers too harsh. Most of these causes become more likely if you are driving your vehicle too fast for the road conditions. The corrective procedure for vehicle skidding is to try and remove the cause of the skid. The first step is to release the brake pedal or ease off the accelerator. Follow that by turning the steering wheel 'into the direction of the skid'. 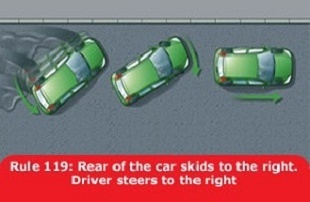 Highway Code rule number 119 and picture shows the rear of the car skidding to the right. In this case you should steer immediately to the right to aid recovery and get the car under control. Simple Explanation: To recover from a skid the driver should attempt to steer the vehicle in the direction of the skid. Apply firm pressure to the footbrake to reduce the speed. Do not release pressure on the brake until the vehicle has slowed to a safe speed. As a rule, vehicles fitted with anti lock brakes can be steered while braking. But, do not assume that vehicles fitted with anti-lock brakes (ABS) will stop in a shorter distance. Rule 121: Brakes get affected by excess water. Driving through deep water can make the braking system much less effective. If you drive through standing water, test your brakes at the first safe opportunity you have. Perform this check by pushing gently on the brake pedal to make sure that they work. In some cases the brakes may still not be effective. Applying light pressure to the braking system while driving slowly will help to dry them out. Normal engine braking is usually eliminated. The vehicle speed will increase quickly downhill. An increased use of the footbrake can reduce its effectiveness. Coasting can affect the steering response (particularly on corners). It may be difficult to select the appropriate gear when required. Rule 123: Motorists MUST NOT leave a parked vehicle unattended with the engine running. Neither must you leave a vehicle engine running unnecessarily while it is stationary on a public road. As a rule, vehicles which will remain stationary for more than a few of minutes should have the parking brake applied and the engine switched off. Doing so helps to reduce exhaust carbon emissions and lowers noise pollution. Note: There are some exceptions to the Highway Code control of the vehicle rules. Drivers can leave the engine running if it is stationary in slow moving traffic. The same applies while you are diagnosing mechanical faults with the vehicle. A speed limit of 30 miles per hour applies to all traffic on all roads in built-up areas with street lighting. The only exception is when road traffic signage shows otherwise. Rule 124: Drivers MUST NOT exceed the maximum speed limits for the road and for your vehicle. The presence of street lights generally means that there is a 30 mph (48 km/h) speed limit unless specified otherwise. Click here for the full table of national speed limits in the United Kingdom. Check how they relate to the vehicle rating and road carriageways in Great Britain. Rule 125: The UK Highway Code for speed limits are the absolute maximums and not something to aim for. They do not always mean it is safe to drive at that speed, irrespective of the weather and road conditions. The layout of the road or highway condition presents hazards (e.g. approaching road bends). The condition of the weather makes it safer to do so. You are driving at night time because it is more difficult to see other road users. Rule 126: Drive your vehicle at a speed that will allow you to stop well within the distance you can see to be clear. Never get closer than the overall Highway Code stopping distances. Leave enough space between your vehicle and the one in front. You should be able to pull up safely if it slows down suddenly or completely stops. Allow at least a two-second gap between you and the vehicle in front on roads carrying faster-moving traffic. Double the 2 second gap on wet roads and increase the distance even further on icy roads. Be aware that drivers of large Lorries and riders of motorcycles need a greater distance to stop. Allow a four-second gap between you and the vehicle in front if you are driving a large vehicle in a tunnel. Leave at least a 5 meter gap between you and the vehicle in front if you have to stop moving inside a tunnel. Allow at least a two-second gap in tunnels where there is reduced visibility. Note: Average car length taken as 4 meters or 13 feet. Distances shown are for general guidance only.